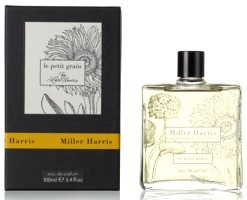 Le Petit Grain is the latest fragrance to join the Nouvelle Edition collection at Miller Harris. Incorporating every element of the orange tree from the oil from the peel of the fruit, to the flowers, to the leaves and the twigs, Le Petit Grain celebrates the great tradition of the cologne family and can be worn and enjoyed by the whole family. With Le Petit Grain, Lyn [Harris] has created a careful fusion between each material. The sweet orange sets the tone and is enhanced by angelica racine, eau de brouts absolute (extraction from the leaves), bergamot from Italy and Sicilian lemon. Additional notes include rosemary, red thyme, French tarragon, lavender, Tunisian neroli, oak moss, vetiver and patchouli leaves. This sounds like all kinds of yum. I adore petitgrain, so looking forward to trying this! It does sound great. This immediately brought to mind Hermes Orange Verte, but the additional notes sound like they would add a good bit of depth and complexity. I think I need to explore this line — it looks really nice and I like the packaging too. Just realize that they make the “Geranium Bourbon” that recently caught my eye. I think I'll be getting a few samples (Citron Citron and Terre de Bois also jump out at me). Had to laugh a little at the bit about “enjoyed by the whole family.” Makes it sound like a Disney movie. Terre de Bois is nice – that's the one Lyn Harris created to smell like “a gorgeous Frenchman”. I think she's done a pretty good job! There is something about the MH aesthetic that just doesn't agree w/ me. There are only 2 I really like: Jasmin Vert & Fleur du Matin. But this one does sound like it might be something I'd like! I liked Fleur de Matin too, but the others I sampled left me sort of cold. Being a citrus freak, I will have to give this one a try – I love petitgrain in fragrance.